There's a cliché that, historically, an eligible maiden would have been very fashionable, a married woman with children would fall behind the times, and an older matron would cling to the styles of years past. This has always bothered me, in part because it seems like an over-correlation to modern attitudes: teenagers and twenty-somethings today have the money and/or time to spend on being fashionable, not to mention the desire, and the ready-to-wear industry is built on catering to them - while women with children have less time and disposable income, and older women are not keen to follow trends like cargo pants, jumpsuits, neon pink, etc. and sometimes even keep getting the same haircuts as when they were younger, or wear similar clothes (which is easy, as fashion is constantly recycling itself). We can't assume that teenagers had the same wherewithal in dressing as today, or that the ability or desire to get new clothes in an old style was present in the same way that it is now. I'm going to leave the younger women and young mothers for another time, but I'd like to examine this idea when it comes to mature women's habits of dress. Using my very thorough Pinterest boards, I did a survey of the (late) eighteenth, nineteenth, and (early) twentieth centuries, looking for images of either women depicted with children who look at least ten and women with grey hair, etc. When it came to portraiture, I tried to mainly consider paintings with solid dates and the name of the sitter, so I could be sure of how old she was and know that the portrait hadn't been dated just based on the style of dress, which could throw off my conclusions. Portraits are not representative of a broad swath of society, but just the upper class and upper middle class - the flipside being that these are the women whose clothing tends to survive, which makes them very relevant to the question of dating extant clothing. 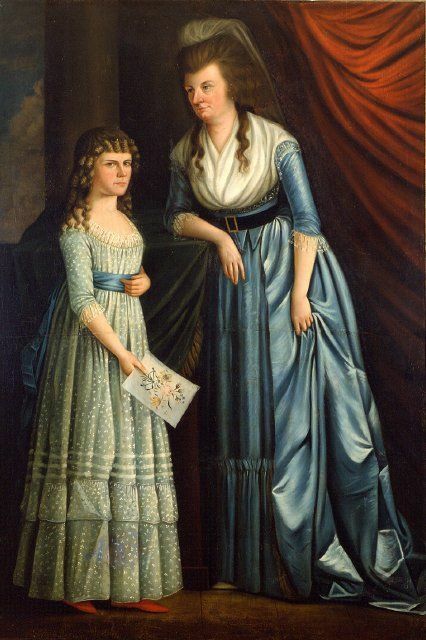 Middle-aged and older women whose portraits were painted were not dressed in the fashions of their youths.Their clothing ranged from current fashions worn with less trim (mainly in early middle age) to sober, dark (often brown, in the 18th century) gowns that could almost be called anti-fashion: they only follow the lead of fashion to a certain extent, but are mainly about an age-appropriate solemnity. I wouldn't call their clothing "in style" but it's also not "out of style" because it was never in style in the first place. For example, in the eighteenth and early nineteenth centuries, flat and concealing kerchiefs that covered the entire chest were very common for this age group. There are various prints and genre paintings available from this period as well, which show older women in both current dress and somewhat old-fashioned dress. Neither option seems well confirmed by the sources: the genre paintings are often sentimental, depicting quaint country scenes that owe more to the artist than to strict realism, and the prints are overwhelmingly satires of "ewe drest lamb fashion", mocking older women for wearing tall wigs, clinging muslin, and/or cosmetics, and occasionally of old women who successfully imitate the young and trick men into finding them attractive. There is almost certainly some exaggeration involved - criticisms of women and their dress have always reeled from one extreme to the other, and are sometimes contradictory - but it shows the general feeling that older women should have a certain decorum and modesty in dress. However, for so many of these prints to exist, for the stereotype to be so well known, there must have been older women who did flaunt more current fashions. Clearly, older and younger women were not supposed to dress in exactly the same way. But then as now, there was a difference between being in fashion and being at the extreme of fashion.. For example, Mrs. Noah Smith, about 40, is dressed in a gown with a high waistline and gathered front - a construction that's appropriate for anybody in 1798 - but it's made of a darker taffeta instead of white muslin, which might have been seen as too trendy for a proper matron. What seems to be have been the case in the 18th century is that, like today, older women were supposed to avoid certain trends, such as very tall hair in the 1770s and white chemise gowns in the 1790s, that were high fashion and/or the province of the young, because to indulge in them was unseemly; at the same time, looking up-to-date was clearly a priority and being seriously behind the times was also cause for ridicule. 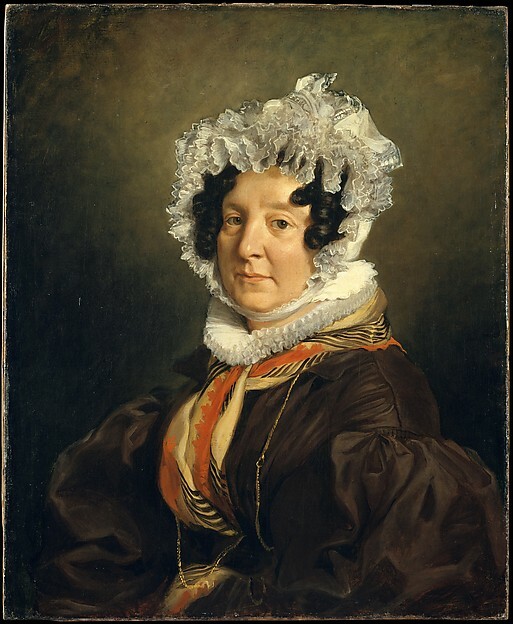 An opaque chemisette or kerchief (or simply a higher neckline) and an enveloping cap were a distinctive older woman's style rather than a sign of being unfashionable. Moving forward into the mid and late nineteenth century, the number of sentimental genre scenes increase - but not all are bent on showing quaint women in old-fashioned dress. The older woman in Waiting for the Verdict (1857), for example, wears a bonnet that's very similar to the young woman's next to her. The grandmother of Grandmother's Birthday (1867) is dressed as well as her daughter, if in black and with a cap on. In portraiture, the general trend of dark and untrimmed gowns worn with opaque chemisettes or other tuckers continued: Jane Burton of Saltmarsh, Aged 77 (1846), Thomasine Blight (aged 63, 1856). Jane Burton's clothes are hard to assess as representative or not of 1846, but the real question would be - do they strongly resemble the clothes of 1836, or 1826, or some other date? The little we can see are the V neckline (appropriate for the mid-1840s) and loose but not full sleeves (certainly not appropriate for the 1830s or later 1820s); her cap, while turned into a modest anti-fashion statement, does show shaping more reminiscent of the early 1830s. Similarly, Thomasine Blight's cap is five to ten years out of date, more characteristic of the late 1840s, with the emphasis down near the cheeks. But this is the beginning of the era of the studio portrait, a medium in which many more details of clothing can be seen. There are photographs of older women in very fashionable - even "trendy" - dress, as in this 1861 portrait. This one of Amanda Langdon in 1884 is likewise an example of fashionable dress, with no frumpy cap and an appropriately fitted and decorated bodice. Lydia Lapham, at age 54 in 1891, wore her hair with curled fringe and her sleeves with puffs at the top. Not all women were quite so au courant: Eliza Pruyn, on her daughter's wedding day in 1901, looked more like a fashion plate from 1898; in this group portrait, the older woman's sleeves are not as inflated as the younger one's. This is a matter of only a few years, though, not a previous generation. In all my searching, what I found can be boiled down into a few generalities. One is that middle-aged or older women tended to wear a toned-down version of fashionable dress - a more dignified version, if you will. Another is that and certain types of caps and neckwear were reserved specifically for older women long past the point where they could be considered something the wearers were holding onto. You have some very good points! As a wanna-be historical costumer (and past 40! ), I've been wondering about those things myself. Thank you! It's been niggling at me for ages. I'm not sure why the idea is so popular (maybe the influence of movies?) but there seems to be quite a lot of evidence out there against it. Very good article! I've been annoyed by this cliche of fashion as well. I don't know much about older women and fashion, but I do know that for a long time, unmarried young women were supposed to dress with a simplicity and modesty suitable to their status while sophisticated and elaborate styles were reserved for those who were a bit older than that and married (and often mothers). In times when disposable income came from men, married women tended to have more money to spend on their appearance than their younger, still unmarried sisters. People seem to forget this quite often, but the vast majority of famous society beauties in history were married women. the vast majority of famous society beauties in history were married women. Exactly!! Fiction focuses on unmarried women because marriage plots are interesting, but women weren't focused on attracting a husband with a long downhill slide afterward. For men and women, marriage was generally a threshold into adult life proper, and it was once you were there that you really got to have more power in choosing your dress. They may not have been very fashionable but older ladies certainly wore their best dresses and accessories. I read it was considered appropriate to give your worn out and cheaper stuff to maids as rewards and only wear your finest clothes.